Of the two companies I sold to 3D Systems, one of them was Print3D, a company I co-founded with Ron Barranco, a pioneer in the 3D printing industry. Print3D offers a bunch of free plug-ins to CAD systems which allow users to quote and order 3D prints of their models. There is no need to save STL files, upload to service bureaus and wait for prices. 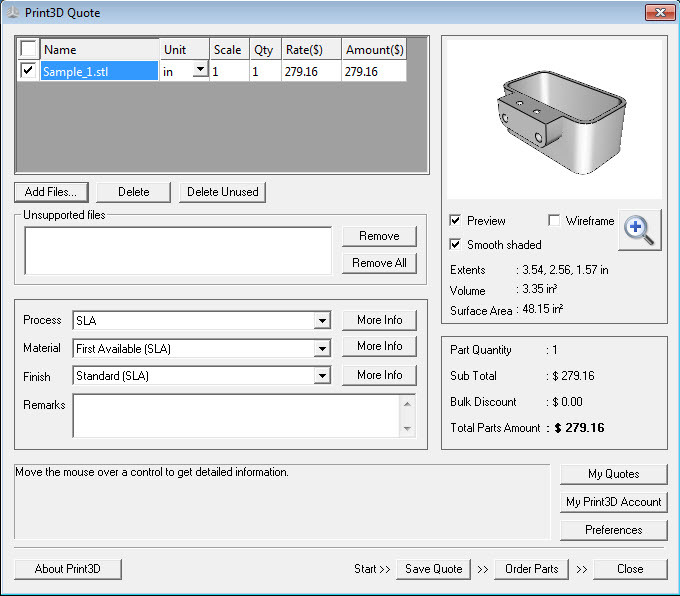 Simply click a button and the Print3D plug-in calculates the price instantly, right within your CAD system. You can play around with different materials and finishes to see the prices change in real time. When you are done selecting your combination of process, material and finish, simply click “Order” and your models are uploaded to the our servers, your parts start building in a 3D Systems facility close to you and they eventually get shipped to your doorstep. We are looking for beta users to help us get the system ready for prime time. To get the beta started we are offering free plug-ins for Alibre Design, Inventor, Pro/ENGINEER, SketchUp and SolidWorks, but will shortly offer plug-ins for other CAD systems as well. We also have a standalone application for those who prefer to use STL or other file formats independently. We are starting with two processes, SLA and SLS, and plan to add more processes as we proceed with the beta. I urge you to download the free software and give it a go when you get the time or if you are considering 3D printing something. Also I’d appreciate it if you could help spread the word around.